For the first time in its 23-year history, the Moldovan flag carrier Air Moldova transported more than one million passengers during one year in 2015. The millionth passenger was serviced on December 30, the airline reports. Air Moldova’s traffic effectively doubled since 2012, when it carried 506,000 passengers. This performance boost was greatly contributed by the mutual ban on air services between Russia and Ukraine, effective since October 25, 2015. On October 26, the Moldovan carrier launched daily flights from Chisinau to Kiev and Odessa (the latter service was terminated on December 1). 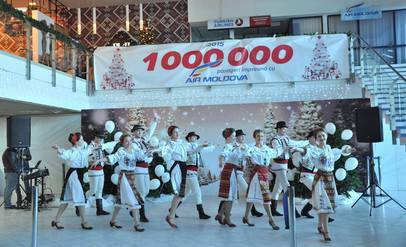 “Ukrainian passengers can fly to Europe and Russia via Chisinau with Air Moldova. Our flights to Moscow come with convenient connection times of about one hour,” the carrier said in its ad at the time. Air Moldova operates two Embraer E190s, two Airbus A320s, one A321, and one A319; the latter was the only aircraft added to the carrier’s fleet in 2015.